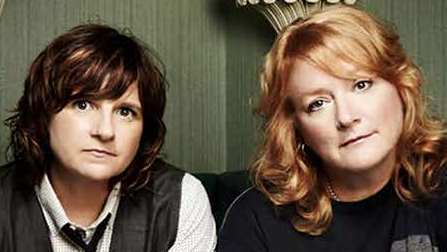 Has there ever been a better time for Indigo Girls? Into this era of heightened women’s voices and LGBTQ visibility, the Grammy-winning singer-songwriters come with a 32-year recording career’s worth of relevance. On May 4, they bring it to Fort Lauderdale — on the heels of a lush, artistic leap of a new album. Like other vocal collaborations whose harmony is immediately unmistakable — Lennon and McCartney, Simon and Garfunkel, Crosby, Stills and Nash — the voices of Emily Saliers and Amy Ray sound like they were made for each other. And on the new Indigo Girls Live With the University of Colorado Symphony Orchestra, their earnest folk-rock interplay is elevated to an in-your-face orchestral elegance. As a performance, it is a feat of levitation. Dramatic arrangements of 22 classics and newer songs integrate the duo’s voices into a rhapsodically rich sound that, while never overpowering them, often rises above instrumental accompaniment to create the harmonic effect of a third lead vocal. Saliers spoke with City & Shore PRIME as she and Ray were putting finishing touches on their first studio LP since 2015’s One Lost Day. It’s due out by the beginning of next year, but concert-goers are getting a preview. Have you played Fort Lauderdale before? Your version of Born to Run on the new Born to Uke benefit album of Springsteen covers is a great, understated departure from the original. That invitation opened my world to Bruce in a way that hadn’t been opened before, because I studied that song for hours. I really wanted to get the instrumental part on the ukulele. Were you a big Springsteen fan before that? I was a fan, but I didn’t go all in like Amy was early on. I had a lot of respect for his work — my favorite album is still Nebraska — but then I read his autobiography and it was just like all over. I was so in. He’s a remarkable human being. Reading how he started with this band and the clubs they played and the things that they adored, it kind of reminded me of when Amy and I started when we played small clubs and we just had this fire to keep playing the next gig. I’m kind of glad I came late to the party. The new album with the symphony is being well-received, isn’t it? I think so. The response from fans has been super-positive and we keep getting asked to play symphony gigs, so that’s a good sign. It’s just the opportunity to bring the songs to life in a way that we never had before. It was exciting for us. And Trina Shoemaker did an incredible job mixing it. You’ve said that it was important that you, Amy and the orchestra were ‘on an even playing field,’ which is a pretty risky artistic decision. Why did you want to do it that way? They’re just really fine arrangements [by Sean O'Loughlin and Stephen Barber]. You don’t want to have those go to waste by people not being able to hear either the intricacy or the simplicity, the power or the subtlety. And we know that the arrangements are good because the orchestras like them. They’re all involved with the songs. You’ve done about 50 of these symphony concerts now, haven’t you? I haven’t counted but we’ve been doing them now for about five years, and there’s no sign of us not continuing. They’re great events because they’re a mix of people — you have the audiences that are there just to support the symphony and most of them have not even heard of us before. And then you have our fans that mix in and sing during the show and then it becomes a bit of a symphony hootenanny. It started out as just an invitation. We were honored — and scared. Oh my God, we were so scared that first show in Chattanooga. Amy said she almost threw up. We were shaken. We’d never done anything like that. You know, you don’t have a click track or a drummer. You’re just all in together. But we just got lucky. We got asked, and we said yes. I imagine it’s also very rewarding to see your songs dressed up in all these new clothes. Yeah. I can’t hear the songs anymore without hearing the orchestral parts in my head, which is really funny. Even if it’s just me and Amy strumming a song for some small, intimate performance, I still hear all those parts in my head. It’s just like, wow, these old songs have been brought to life in a very new way for us. As an artist with a vital social conscience, what’s your reaction to the new women’s movements? Have they peaked or are they just getting started? I think that the proof is in the pudding. It’s been very important for the Me Too movement to come to the forefront of the news. But I also think there’s always a backlash, particularly a conservative backlash. It is still a male-run business world and society, so it’s a long, long arc of change. It just remains to be seen whether or not that momentum can stay on without a backlash. There are a lot of men who are afraid of losing the power that they have. And there were a lot of ridiculous comments like, the repartee between men and women can never be the same again, and bull—- like that. But after the midterms I felt some hope — you know, the power of a new crop of women in the House. And they’re not afraid of those old white men. But those are very systemic problems that are not going to be dismantled and fixed with a movement unless they’re just taken apart piece by piece. And that takes time, consciousness. So we’ll see. In the Trump era, do you feel that inclusivity for LGBTQ causes is improving? Not while he’s president. There’s no way — with his decision on transgender in the military… As queer people, we never take our rights for granted because we realize that a president like Trump can come in and a wave of conservatism can take over the country and put any advances that we’ve made purely in jeopardy. So as a gay person, I think we’re under attack right now. Now, with social media and not knowing what the truth is, people are confused and angry and afraid. And I think that conservative fear-mongering people have a much more direct way of keeping their followers in fear than progressives have of galvanizing progressives. The power of language to dismantle democracy has been very acute in recent times. And, you know, when I look at the history of humanity, I realize that there’s always going to be dichotomy, there’s always going to be conflict. But those of us who are dedicated to peace work and justice work — that’s the work we’re going to keep doing. And if we can’t win over the entire world, at least people keep those movements of hope and progress alive. And I believe that. I think that’s our job.